In the almost six years since I last waddled around in the name of procreation — I know, I make it sound so glowy and glamorous — to my delight, two things in particular have changed: 1. You can now get maternity pants that have almost all of the dignity of regular ones, thanks to small elastic panels above each pocket that frankly would be as welcome the day after Thanksgiving as they are now that I’m approaching the six-month mark and people no longer believe me when I said I just had a really big lunch. (However, a New York-specific rule remains: you’re not actually “big” until someone willingly cedes his or her seat on the subway for you, by which standards, I must be svelte. Hey, I’ll take it.) 2. More pertinently to the scope of a cooking website, a whole lot of bars are making really great mocktails. I credit the fact that there’s been something of a cocktail revolution over the last five years, wherein housemade bitters, syrups, fresh-pressed seasonal juices, sodas and fresh herbs are almost the norm, and the bartenders, nay, mixologists that craft them are name-dropped almost as often as head chefs. People who choose not to drink whether due to beliefs, lifestyle, diet or due date are no longer expected to sip a club soda and twist of lime they could have bought at the local bodega for pennies to take part in what I consider one of the holiest social rituals of spring — hanging out with friends at happy hour on one of the first warm days. I’m doing my part to try them all and it is in this “research” that I realized I’ve really stiffed this site of a delicious opportunity to have more drinks that work for everyone. The best ones are as good without alcohol as they are with, say, rum, but taste nothing like compromise (not that I can resist teasingly calling it one, just the same). This is a riff on one I had at Jeffrey’s Grocery while killing time between the babysitter arriving and the start time of the party we were going to a couple weekends ago. As written, it had pineapple, lime, honey and coconut in it, but I couldn’t resist adding fresh mint, to complete the glorious mash-up of a piña colada and a mojito. The mint is lightly muddled before shaking the whole of it vigorously* over ice. If you finish it (not pictured) with a splash of fizzy water, the top will foam up as dramatically as an ice cream soda, which was about the point that I realized two other awesome things about mocktails: you don’t have to wait until any time of the day or day of the week for it to be socially acceptable to drink them and you get to share them with your kid. See? Everybody wins. * and let’s definitely not talk about my husband walking in to ask me a question while I was mid-shake which led somehow to me draping myself and the kitchen head to toe in so much sticky. I promise not to quit my day job to become a bartender, okay? A little bit mojito, a little bit piña colada, this tastes like everything I miss about warm weather and sandy beaches, and is especially necessary when the weather report has the audacity to predict snow on the first day of spring. Can you put rum in this? Of course you can! I can’t decide whether dark (the piña colada standard) or light (the mojito standard) would be better. I’ll let you know in a few months. 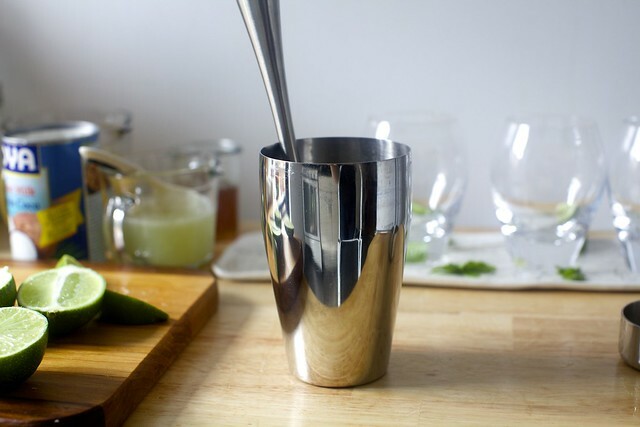 In the bottom of a cocktail shaker, lightly muddle mint — no need to render it into small flecks, but if you break it up a little, more flavor will be released. Add pineapple, lime, honey, coconut milk and a few ice cubes and shake it well. 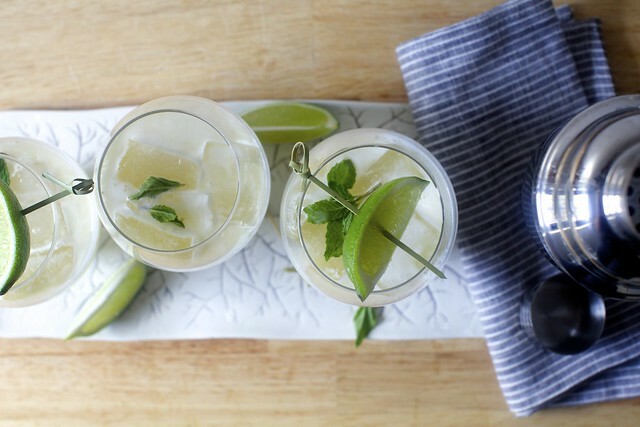 Pour over ice cubes in glasses, finish with a splash of seltzer and garnishes. Close your eyes and pretend you’re somewhere tropical. I’m pregnant now, and I have to have this. Now. I love the mash-up! I will most definitely be adding the rum though! Hi Deb! What would you add to this if you wanted to make it a cocktail? Thanks! Love your recipes! I’ve been hoping to see some mocktails here since your post announcing a sibling for Jacob (and congratulations, by the way!). 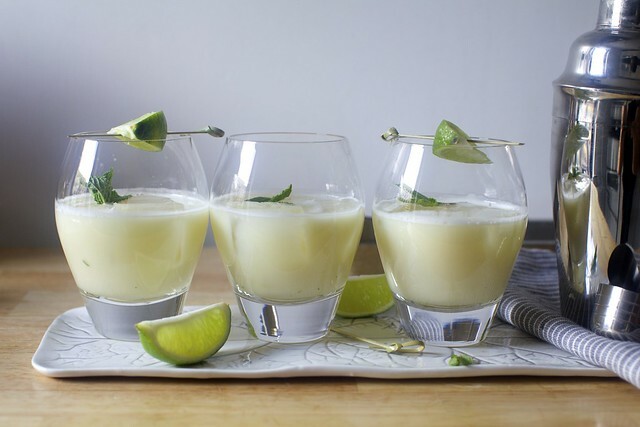 As a currently-expecting lover of complex and not too sweet cocktails, I’ve been looking for inspiration for non-alcoholic drinks that are both interesting and non-cloying everywhere, and this looks delicious! As well as an excellent way to say “good riddance” to a winter that has been much too cold and long. Gina — Whoops, just a broken link. Now fixed, thanks. This reminds me of a “lime in de coconut” drink I had in the carribean. Yum. I don’t think the mocktail revolution has reached northwest Indiana. I am pregnant, and am sick of drinking overly sweet juices at social gatherings (non-alcoholic beer is surprisingly not bad, though!). Thank you so much for sharing, I plan to drink a lot of this at summer BBQs! For the sake of research, I’ll try this tomorrow night with alcohol, and report back on the better rum. I’d try it tonight but le sigh, I’ll be at my third work event this week. Can’t wait to try this. I’m just like you expecting my second after 5 years and I am craving tangy drinks. I think we are a month apart. Good luck to you. Ohhhh. Oh oh oh! Doing this pronto. Question- canned coconut milk, or the stuff in the carton in the refrigerated section? Christine — Canned coconut milk. The other stuff is just coconut water. Amazing. I think I could enjoy a frozen version of this with whole pineapple instead of juice and a few ice cubes – all whizzed in a blender. Love the recipe – and the name! No buns baking here; so I’m going to add rum. I only have Appleton dark (when in Jamaica, and all that…) so I’ll report back. Thank you for this! I don’t drink so I’m used to being disappointed when websites I follow posts a cocktail. Like now i just have to wait x days for the next post for dinner inspiration. Now I have something to serve guests that I can actually taste. I don’t have the religious/health/impending baby excuse either so it’d be nice to walk into a place and ask for something non-alcoholic and get something A) interesting and at least worth half of what they charge for it and B) without being subjected to the 3rd degree as to why I don’t just get something alcoholic. These sound so good!! Pregnant or not, I am DOWN! Thank you, thank you, THANK YOU! I have a 5-month-old baby and am still breastfeeding, so I’d much rather mostly do without the booze, but I do SOOOO miss a good cocktail! This is getting in my belly this weekend! As a fellow pregnant woman thanks for this one!! Nothing worse then a spring/summer party where everyone is enjoying cocktails except you! I’m making this with fresh coco milk I’ll strain after blending the hard meat, and ditto the pineapple juice. I think it will rock! Thx! I wonder if I can just put everything in a blender for the “frozen” version of this. That ice cube tray! I hated having to crack those when I was a kid. Fortunately, I can drown my unpleasant memories with this yummy looking drink plus rum! Hang in there, nothing is forever. Yum! This looks great! My mint is starting to peek it’s pretty green leaves up from the ground so I’m excited to try this! Take care! 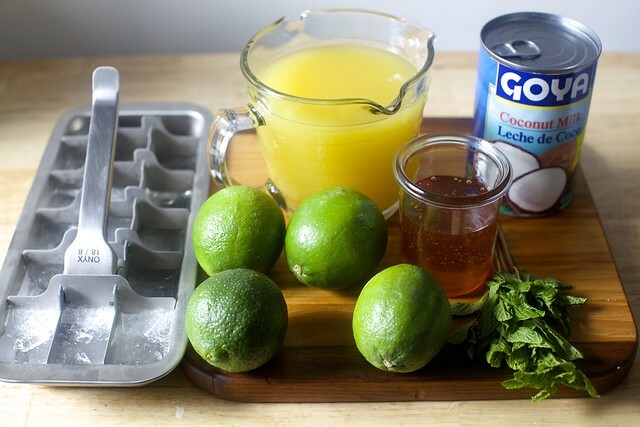 I have a (sort of) similar recipe but it uses coco lopez, so no honey, and I use orange juice instead of the lime but I never thought to add mint or seltzer. What a great idea! The seltzer would really brighten it up as the Coco Lopez is so much thicker than coconut milk. Thanks for this! This sounds wonderful. Thank you! There is something dreadfully wrong with my taste buds, and I sadly (very sadly) do not like most cocktails, no matter the exotic ingredient, fun drinking vessel, or fancy name. This sounds right up my alley and I shall be making it ASAP. Thanks for this! I’m due in August and, at the risk of sounding like an alcoholic, have been dreading spending the spring patio weather without a cocktail. This could work! I also love your ice cube tray! Where did you get it, if I may ask? Of COURSE you have the perfect swizzle sticks!!! what a darling photo. This looks wonderful! Can you tell me about your juicer, and whether or not you would recommend it? I’ve been eyeing a few, but don’t want to break the bank on a juicer. Then again, last summer I spent way too much time making watermelon juice by throwing quarters of a watermelon in the food processor and then straining it; so perhaps the money would be well spent on even an expensive juicer :) Thanks for all you do! Thank you thank you, I have the religious and health reason to not drink. I have an opera subscription here in Utah and in the member lounge they always have nice wines and canned sodas or water for the rest of us. Since I remember wine well I really resent this. 7up or Coke are not a non-alcoholic substitute for wine. Te city is half Mormon and half of those practice, so 1/4 of their clientele don’t drink and they have nothing for us. If only they hung around Smitten Kitchen they would know better. A church member I knew who entertained in LA was a master of mocktails and made an amazing ginger syrup with fresh ginger for a truly adult ginger ale. My daughter in LA has been telling bartenders to make her up something special when she goes out and they have been wowing her with mocktails that have ingredients like fresh cracked pepper. As you pointed out you can always add the alcohol. If you want the buzz without the flavor there is always vodka. Ashley — They’re actually stemless wine glasses from Iittala (Stella line); we registered for them when we got married in 2005 and they’ve since been discontinued, which means I dread what happens when we realize how many have broken over the years. Brooke — My confession is the thing I missed more than ANYTHING when I was due in September last time was beer. Cold beer + rooftop barbecue + late August… I still feel the longing! Mary S — Yes, not that you asked the backstory but we used to have those silicone perfect cube trays and they absorbed such a terrible freezer odor which stank up all of the ice, I had to get rid of them. (And then replaced them. And the same thing happened again because I don’t learn my lesson.) When we moved, I bought one tray, this one. I found it (and still find it) appallingly expensive and honestly not that easy to crack the tray loose once frozen but 1. it’s totally stink-free (yay), 2. it seems to freeze the ice pretty quickly, 3. I like that some of the ice cubes break up into different sizes, fun for ice-crunchers like me. Deb, I’m stoked about this because 1) I have all the ingredients 2) I’m also pregnant (first babe!) 3) it doesn’t matter because I don’t drink alcohol to begin with 4) you might give us more options in the future for non-alcoholic drinks(!!) and 5) tomorrow is my birthday and the first day of spring, which will be celebrated with these in hand! Thanks – can’t wait for all the sipping. Looks so sweet. I would love to try this recipe! Thank you, Deb. This looks delicious. I’m permanently off alcohol, look forward to enjoying this, and would love any other ideas you have up this alley as well. Jacob’s “ready to be a big brother” quote brought tears to my eyes. So dear! My current go-to mocktail : Virgin Caesar. Rim rocks glass with celery salt; add ice, horseradish, clamato juice, worcestershire sauce, tabasco, salt & pepper to taste & a small celery stalk to garnish (& act as a stir stick). One might impale a couple of small cooked prawns or scallops or some kind of combination thereof onto a stir stick for extra garnish if feeling exceedingly festive. Sub V8 or tomato juice for the clamato if the latter is unavailable or otherwise inadmissable. yum yum yum a frothy looking pineapple mocktail! this is perfect for the upcoming warm days that florida has in store for us. I recently found that ice cube tray in GOLD in a thrift store here in Paris for maybe 2€ and I DIDN’T BUY IT. It looked like it had popped out of Liberace’s freezer. I obsessed about it and went back the next week and, well you know the end of this story. I’m waiting for the day I go into a hipster cocktail bar and see it mocking me from behind the bar. Looks amazing! I would definitely try it! Honestly, I was just saying to my husband that I wish someone would invent something for people who do not drink alcohol that tastes good, relaxes you, but does not give you a hang over and the other problems that come with drinking alcohol. Beyond religious reasons (I’m with you #38 Liz), alcohol has always made me feel sick to my stomach (even in RX medicine), so the very idea that I can have a lovely, tasty drink like this, almost makes my wish come true. Thanks for the great recipe! I am also 6 months preggers and was also excited when I went to my friend’s 40th at a tiki bar — fun mocktails! Then I discovered that the pregnant version of drinking too much meant up to pee 500 times that night! Good to know that mocktails are in, maybe I won’t suffer that much if I decide to have another kid. For me, giving up alcohol was the most difficult thing about my two pregnancies (I swear I am not an alcoholic, I just really enjoy my glass of wine with dinner and the occasional cocktail). The pains of labor were nothing, compared to the pains of giving up all alcohol for NINE long months!!! Hang on, Deb! This looks amazing! Can’t wait to sip this on the balcony once spring comes!! These look like milky mojitos I could dig. Even when St Patty’s is over, the drinking continues. The season lasts till one of us is strung dry. Great mocktail honey! Instead of honey, how about some sweetened condensed milk? Seriously! So what’s the best method to make this if you don’t have a cocktail shaker? Nor do particularly relish using my blender unless I do a frozen version…will it work if I just stir all the ingredients together? My vote is for light rum…or even vodka would be great. Can’t wait for summer!! Here’s to not having anyone give up their seat. @leslie #58 if you are brave and/or have a knack for such things, as well as a smaller glass that fits inside a larger glass, you can shake it boston shaker style. i personally haven’t yet mastered this without making a mess, but have some less klutzy friends who used to make it work this way all the time in our old apartment which was devoid of any “real” cocktail tools but full of pint-ish glasses. also, this person uses a jar with some holes drilled in it! Deb, I saw the reference to ice crunching. My father was a supreme ice cruncher and after many years or what we thought was a crazy habit, a doc at Vanderbilt said it was most likely due to an iron deficiency (thanks to my mom who brought it up during an unrelated visit for a back problem). They put him on iron supplements and that was the end of the ice crunching! According to the Mayo clinic, iron deficieny anemia is often associated with ice crunching, though there can be other causes. Please mention this to your doc, especially since you are pregnant. Ah, and also please forgive me if I have overstepped my boundaries–it’s a mother hen thing. Sounds fabulous Deb. My favourite, favourite mocktail is a (hardly any sugar) Ipanema (https://thejameskitchen.wordpress.com/2014/08/14/ipanema/) – quite the alternative to the caipirinha – throw in the respective song and imagine yourself on a sun-drenched Brazilian beach. It even makes you feel a little dizzy. OH MY GOSH I’M MAKING THIS FOR MY BIRTHDAY HOW INSANELY DELICIOUS!! Jacob is going to be the BEST big brother! Yeah, try being the only adult at parties who can’t drink because of an alcohol allergy! (Even my doctor had never heard of it, a side effect of being on blood pressure meds.) Soft drinks are okay, but I crave a Margarita or Daquiri on occasion, and some faux beers are okay, and some are awful. Wish there was something like those drinks that I could have as soft drinks just don’t cut it with some foods. you can find similar glasses at REI. I have them in my Airstream…. should read: “…..my husband walking in to ask me question…..” and will def try the mocktail. Love the name. Leslie — Just a jar with a lid will work! Sarah Heat — I would never say no to an excuse to have sweetened condensed milk. Claire — Thanks, now fixed. You might want to correct “Homemade Wheat Thing” listed as a recipe from 2.5 years ago, with “Homemade Wheat Thins”. Can I ask what you did here – canned? Or fresh? If fresh how in the world do you juice a pineapple? I’m so glad that you do the “one year ago….two year ago….etc” links! This reminds me that I have not yet made that lovely looking coconut bread from two years ago. Two years! Is that possible…? As someone who almost never drinks (alcohol = giant migraines for me), I love this! I’m also becoming quite the connoisseur of “interesting” sodas (I think my current favorite is Sipp lemon flower with lemon, elderflower, and tarragon). Most of them are made for more discerning palates than, say, mine as a seven-year-old, so they’re not as sweet as, and more complex than, normal sodas. But, of course, homemade mocktails are even better! I remember the first time I got a seat on the subway! I felt like NOW IM REALLY PREGNANT. I’m also currently pregnant and happen to have everything but the mint on hand, so I’m going to go make this. Now. Thanks! Thank you!!!! I do not drink alcohol for various reasons, and would love to see more mocktails. I love the idea of a lovely drink in a lovely glass, but almost all recipes online have alcohol. Please bring us more recipes like this; they are really hard to find-at least they have been for me. I love the idea of something lovely to drink in a beautiful glass. I don’t need the alcohol. I do drink regular drinks. But sometimes you are going to be driving soon or your guests. Fun mocktail. Oh my, this sounds just perfect to make Friday nights a little extra blissful. Coconut milk must make it really creamy. I am off to make this! What kind of pineapple juice? How much rum would you add? These are yummy added some Parrot Bay rum and White Bacardi!! Does it have a name? These look amazing for summer! 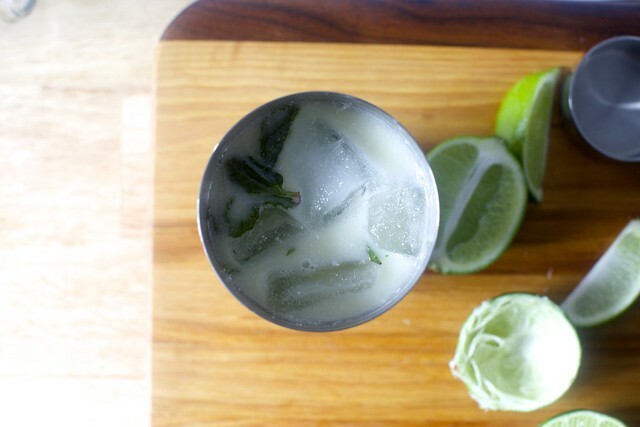 I am a big fan of both coconut and lime, and can’t wait to try this recipe! Thanks for sharing. I agree with Sarah G! Lots of preggos in the comments, including myself, are thankful for your posting this!! I can’t wait to try it! these look heavenly! and with a little rum too. Just made this for my Pina Colada loving husband! I did not use mint and added Bacardi Light rum! WOW!!!! Creamy, light and PERFECT! This was delicious! I made it with a shot of light rum for the grown ups and with the splash of seltzer for the young ‘ins. Everyone enjoyed it immensely. I loved the play of flavors off each other and the level of sweetness was perfect. Yum, yum, yum! Thank goodness, Deb! I went to a cocktail bar the other day (I’m in Montreal) and asked the bartender “What fancy pants drink can you make me that doesn’t have alcohol?” and she flashed me a look that pretty much said, “Umm, why are you here?” Because, what, pregnant ladies can’t have fun and drink fabulous concoctions? No way! So I’m happy to know that I can make my own! Had to report back – I made this yesterday, and it was delicious. My coconut milk had split and no amount of shaking could get it to re-emulsify, but a quick spin in the blender left me with a delicious, creamy but not *too* creamy drink. Pineapple juice — I used canned, though if you have a juicer it’s definitely delicious freshly made. If you don’t have a juicer but are maybe a little crazy (I say this about myself, too, as I’ve done it) you can blend the heck out of fresh pineapple until it’s as pureed as you can get it then strain it through a fine-mesh strainer or at least a couple layers of tight cheesecloth to make pineapple juice without a juicer. Looks delicious! I can’t wait to make it. I’ve been loving mocktails during my pregnancy. I agree that it’s so nice to be able to participate in the ritual of cocktails with my husband or friends and not just be stuck drinking water. If you like a chai flavor, I’d suggest googling a “Chai Blossom” from Bon Appetit. One of my favorite mocktails this past winter. Deb, not to pregnancy-hijack your blog or anything, but…last time around, I froze absolutely nothing, and after two months of take-out (which you can do pretty well in New York, but still) I thought I would scream if I saw another delivery bike pull up to our door. This time, to avoid that — and also because apparently the little person who now lives in our house expects dinner every night — I’m trying to make a few things in advance. I love the freezer-friendly index here, so if you have anything to add to it, I’d sure appreciate it! Also wondering if the corn-risotto stuffed peppers from the cookbook would be good candidates for a make-ahead dish. Thanks! Looked yummy, so made over the weekend. We used fresh pineapple juice from Trader Joe’s and instead of honey, added more pineapple juice, since there’s really no sweetness coming from the coconut milk. We added light rum….maybe too much, and they were delightful! Best mocktail in the city is the Jandles at EMP. The Gingered Ale there is no slouch either. My personal I-guess-I’m-visibly-pregnant-in-NYC story: I didn’t think I was showing that much, maybe 5 months along, but when I ordered my burger at Shake Shack, the lady behind the counter said “I’ll make that well done, ’cause you’re with child.” Ok then! If you’ve never tried them before, I would also recommend playing with shrubs. Sweet and tangy, made from fruit, sugar, and vinegar. Makes amazing sodas with nothing more than seltzer, but I like to muddle some fresh herbs, and blend in some lemon/orange/grapefruit San Pelegrino or some ginger beer. Maybe a few dashes of bitters, if you can have trace amounts of alcohol (one serving of bitters won’t take a drink anywhere near 1% ABV). Thank you for this! I’ve been following your blog for years and on a whim popped in today and my first-time pregnant self is giddy with your mocktail! I can’t wait to make this tonight (who are we kidding? I can’t wait for my husband to make me this tonight!). Yummy, we are in Marco Island, Florida for the week. Nice to share these with my sixteen year old. Even nicer to be in the eighty degree weather. Leah — We must be the same person because I did the same thing. How could I possibly be worried about not having food to eat in NYC? We loved our take-out options (sadly, many of our healthy favorites have closed, sob, Hummus Place) but I got tired of eating from containers so quickly. I would really like to do better this time, but my cooking has actually been hijacked by the next book which I am desperately hoping to finish before the baby gets here (likelihood: 25%)… but I will do my best. It would be so awesome to defrost those poblanos in late July! Wishing you a belated congratulations! Deb, on the subject of non-alcoholic drinks….I hope that you have discovered the multitude of varieties of aguas frescas that feel like summer anytime of the year. One particularly odd one – but unexpectedly fantastic – is agua de platano/banana. It is strange because 1) generally I think of banana creating a smoothy type texture and 2) the banana turns brown. But it is delicious and comes out refreshingly like the other aguas. Think sweet cinnamon banana flavored water and if you use cinnamon sticks you don’t have cinnamon floaties. Okay, maybe that image won’t work for the pregnancy. But if you are up to it, try it! Thanks, Deb! I’m going to give the poblanos a shot. Most of my freezer options are what I think of as cold-weather fare — chili, pot pies, etc. — and so I’m trying to come up with lighter dishes that will reheat well and will suit our appetites in the warmer temperatures. Good luck in your third trimester and with the other “baby” (you know, the dust-jacketed one)! I have the same standards for measuring my pregnancy size. I’m now seven months in and have not received one subway seat. Taking it as a compliment! Leah — Thanks, I agree that freezer stuff (as well as slow-cooker stuff) seems much more wintery. Not exactly “light” but there’s an artichoke-stuffed shells recipe in the first Book Baby that’s at least more springy in flavor. And uses a white sauce. Maybe that too? This sounds so delicious. I have all the ingredients, so I may have to make it today…though the Tennessee spring weather has hit an unwelcome cold snap. I can pretend it’s warm though, right? I am making a pitcher of this for Easter today. With the rum. This totally satisfied my pineapple/soda/I’ll scream if I see another glass of water! cravings during this pregnancy. Thank you! Aww, ditto that Barbara Qualls! This mocktail is AMAZING! I just made it. If you’re going to halve it like I did, go full lime and don’t skip the mint. THE MINT MAKES IT. Drinking it right now! Mmm! Kiran — Definitely. Make the juice mix and shake it up with ice at the last minute. Also add fizz at the end, if you were planning to use some. Consolation Prize is a swell name, but I humbly put forth that this drink is so superb with dark rum that the alcoholic version needs its very own moniker. I’ve made it a number of times now, always sans seltzer and with a splash of simple syrup (in place of the honey, which just froze to the bottom of my cocktail shaker and caused frustration), and when folks ask, “What is THIS?” I wish for a suitable, snappy name. I say go big: call it Fear of Flying or Junior Promenade Number 2 or Mystical Mint Moonicorn … but I’ll defer to you for the true handle. It’s a terrific drink. Cheers! Is this something that I could make the day before? Or is it better to make it before serving. Kelly — Ice and seltzer are things you’d only want to add at the end. And maybe the mint-muddling too, as it might get soggy or discolored if it sits for a day. The other stuff can be mixed in advance. This is a delicious drink, and my pregnant self is quite grateful. 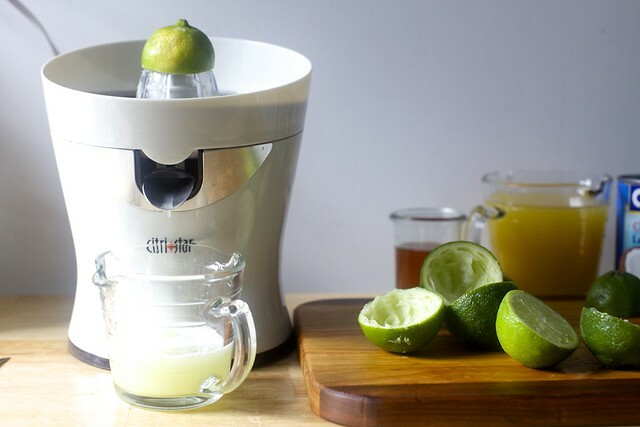 One tip for EVERYONE: if you have or can get an electric juicer, or if you even have one of those hand-held things that you can twist to get the juice out of your limes, buy/use them. I made a quadruple batch of this, and let me tell you – I either have Cross-Fit forearms or carpal tunnel. The drink is delicious, nonetheless, and I’d recommend it to anyone looking for a substantial, delicious, take-me-away summer cocktail. If you are going to add rum, don’t get hung up on dark vs. light – go with whichever one tastes better to you. I got hooked on Gosling’s on a trip to Bermuda, and it’s been my “go-to” rum ever since. It’s actually fabulous in a mojito. Thank you for this innovative recipe! Deciding to try avoiding alcohol definitely made me more interested in mixing different ingredients together and getting creative. The mix of creamy sweet ‘Piña Colada’ and the tangy refreshing ‘Mojito’ is so interesting to me and I really want to give this a ago. I found this a little bit late but it’s spring here now so I think it would fit the weather perfectly! Deb! What’s the final verdict? Light or dark rum? I might use light rum, but only for aesthetics. In all other things, dark rum is where it’s at, IMHO. This looks (and, hopefully, tastes) like Macao Trading Company’s [fantastic] Drunken Dragon’s Milk (http://www.complex.com/pop-culture/2013/01/the-25-best-cocktails-in-nyc-right-now-being-made-in-gifs/drunken-dragons-milk). I aggressively failed when trying to recreate their version, perhaps because I could not find pandan or an alternative anywhere. Check it out! What a great recipe! I’m 20 weeks pregnant and I’ve been making mocktails for my cocktail blog – I featured this one this week: http://www.garnishblog.com/2017/05/mocktail-consolation-prize.html. Thanks for a delicious non-alcoholic option! Made tonight with Mount Gay. Mmmmmmm…. I’m guessing coconut rum would be spectacular in this!